Last night Rob and I had a date. Tuesday night, nothing particularly special about it. But we made it special. We made it movie night, grocery night, talk night. Last year I read the book, The Help, and like so many, loved it for its humor and touches of tragedy, yet over-riding triumph of the human spirit. It is a wonderful story of awakening minds, standing up for what is right, and the dignity of spirit that can’t be diminished by work or position, however lowly those may be. Character shines through. Ketchikan has a two-screen theater, but I’ve noticed that we’re consistently behind the rest of the world by about six weeks with movie release dates. So while everyone else was seeing this movie back in August, we are only just now seeing it in October. I grew up in Mississippi. But I’m happy to say that I didn’t witness the types of scenes that the movie portrays. I know they happened. I’ve heard stories here and there. But I didn’t grow up with a maid in my home. So I can relate to some things, and yet I can’t. The southern accents, the homes, so much of the movie rang true to me. Although I don’t remember the specific historic time (I was a bit young, less than three years old when the events in the movie occurred), the general look and feel seemed authentic. Some of the events really happened, of course. Medgar Evers was killed in June of 1963. The civil rights movement wasn’t an era to be studied in a history class, it was a current event. There are other signs of the times that seem strange viewed from 2011: the hairstyles, the dress, the cars. In several scenes people are smoking. But it isn’t the smoking itself that catches the attention: it’s the location. In one scene, a receptionist at the local newspaper office is smoking, on the job, during work hours. That would never happen today. The painful discussions of the practical side of segregation would not occur today. No one is sending sanitation initiatives to government officials in 2011. But the best parts of the movie are the timeless bits: the scenes that show people living up to what is best in themselves, challenging others to see the value of humans, not of color; and recognition of the most basic values of life. Children, women, the elderly, minorities, and the poor are all celebrated in this film. But it is not done in a condescending or patronizing way. The emphasis is on the worth of people in general, the recognition that all have value and a contribution to make. The film is also about redemption and growth. The main characters all grow throughout the story, and we are allowed to see them shifting their opinions, embracing a different view of life. In the end, the movie is about claiming the potential we have, and treating people right along the way. ← Five years in the army: congratulations to my son! I, like you, am sometimes behind the eight ball on catching movies. I’m still trying to find ‘Midnight in Paris’ someplace close. May have to wait til December when it is released on DVD. 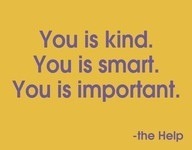 As for ‘The Help’ – I only saw it last month and cried like a baby. I also cringed – as a southern woman – at some of the language and attitudes. Hard to believe people ever acted that way and wonderful to know how much we as well as they have changed. I, too, loved the book. The movie version was one of the few that was as good as the book. Fun side story: I read the book last summer and gave it to my Mom & Sister when they visited for our son’s wedding. They both read it and, while in Canada visiting them last week, we went together to the movie. Neat! Well said Sheila! Beautiful piece.